A bardic chair has been returned to north Wales after it vanished over a 100 years ago then turned up in Canada. How and when the chair was moved remains a mystery and a local Flintshire historian is trying to piece together the journey it took. The chair was offered as a prize during an Eisteddfod held in Bagillt in 1889 but was never won because the standard was not considered high enough. A service celebrating the chair's is to be held at Bagillt on 22 October. The chair, found in a Canadian antique shop, is currently being kept in St Mary's Church in the village and one of the people involved in it's return is chairman of the Bagillt History Club, Colin Sheen. "It's absolutely brilliant," he said. "I relaunched the history club with the story of the chair never thinking it would be returned." It disappeared after the two-day festival and later turned up in an antique shop in Victoria, British Columbia where it was bought by the Craigdarroch Castle Society in 1976. The chair was sold in 1996 to the Victoria Welsh Society, who recognised its cultural and historical values. 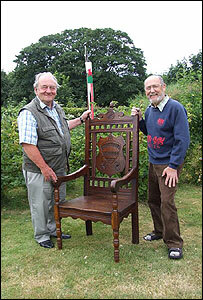 Five years later Mr Sheen rediscovered the chair as it was featured on the Welsh Society's web site. A member of the Bagillt History Club, Emlyn Round, originally from the village but who now lives in British Columbia co-operated with Mr Sheen to repatriate the chair. After a presentation by Mr Round to the Welsh Society in Victoria - it was agreed the chair should be returned to north Wales. The original purchase costs were not passed on, only the symbolic £1 as deed of sale, was required. The chair was transported from Canada to Manchester airport and then taken to Bagillt where it was last seen 117 years ago. But Mr Sheen is determined to piece together the missing years and he intends to ensure the chair's history will be noted and put on a DVD. "We're looking forward to the future - from 100 years hence maybe - making sure the next generation will know the story," he said.